Jharkhand High Court Recruitment 2018: An employment Notification is to be ready for publication which will be related to Jharkhand High Court Legal Assistant Recruitment 2018. Well skilled and interested applicants are invited and can get the all recruitment details from here. Candidates can complete Jharkhand High Court Recruitment 2018 Application Form process by submitting in the online mode before the last date which is 15th September 2018. 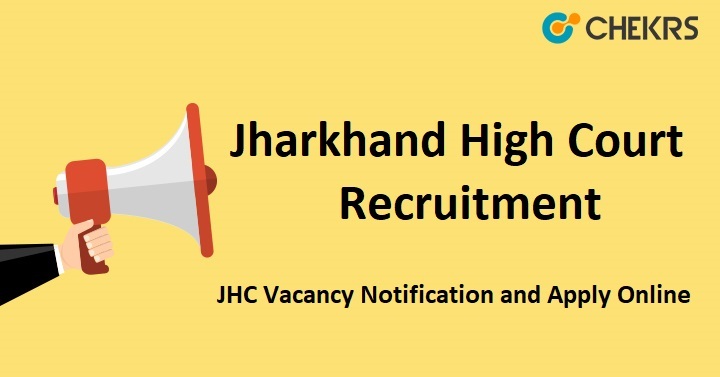 Applicants who wish to join the Government Jobs then check the Jharkhand High Court Legal Assistant Notification details such as eligibility, selection process, age limit etc. from here. Visit the official page of Jharkhand High court. Choose the CORRIGENDUM OF ADVT. NO 02/ACCTS./2018 FOR THE POST OF LEGAL ASSISTANT IN THE HIGH COURT OF JHARKHAND, RANCHI Link & click on it. Read the all notification details. Now back to Recruitment Page and Click on ONLINE APPLICATION FORM FOR THE POST OF LEGAL ASSISTANT IN THE HIGH COURT OF JHARKHAND, RANCHI Link. Remarks: Get the Latest Job alert in Government Sector by visiting our website www.jobs.chekrs.com. We frequently keep on updating the latest Jharkhand High Court Recruitment 2018. You can also bookmark our page and check the latest notification of jobs. For any query or review, we welcome your valuable comments in the comment section. We will get in touch with you shortly.